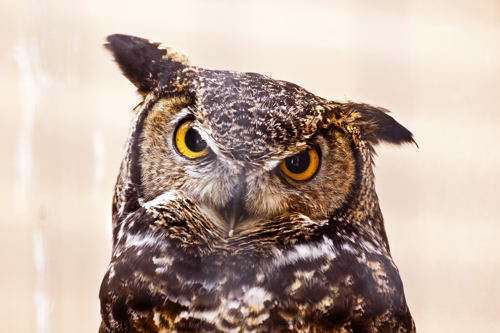 Hawks and owls can most certainly be a danger to chickens (heck, even CROWS can be a danger to juveniles or bantams). However, only a few types usually bother chickens. The raptors most often associated with flock losses are red-tailed hawks, goshawks, and great horned owls. Having a rooster can help alert the girls to a predator in time for them to run for cover. Some people choose to keep a run covered with netting so flying predators are not a problem. Generally speaking, hawks are mostly a problem in the spring and in the fall when they are migrating (and they might see your flock as a quick source of food). At other times of the year, hawks have such large ranges, that they are unlikely to remain in one area for long. In fact, they are much more likely to hunt animals that make easier prey--wild birds or rodents without a vigilant human or rooster protector. If you have a hawk hanging around your flock for a long time, however, you may be able to contact someone in your local extension office to trap relocate it. Hawks and other raptors are protected by international treaty, and it is a federal offense to trap or harm one without the proper permits.